We present the cases of four patients (two men and two women, mean age of 48.5 years) with surgically confirmed partial anterior tarsal syndrome, diagnosed by ultrasound. All patients reported pain in the dorsal aspect of the forefoot radiating to the first intermetatarsal space. Ultrasound showed compression of the medial branch of the deep fibular nerve by the extensor hallucis brevis tendon at the level of the Lisfranc joint, associated with a hypoechoic neuroma. The ultrasound allowed a correct diagnosis to be obtained, which was not evident from clinical examination or by standard radiographs (four patients) or MRI (three patients). Surgery confirmed the sonographic findings, and all patients showed complete recovery. Bianchi S, Droz L, Lups Deplaine C, Dubois Ferriere V, Delmi M. Ultrasound of the sural nerve: normal and pathological appearance. A pictorial essay. J Ultrasound Med. 2017. https://doi.org/10.1002/jum.14444. 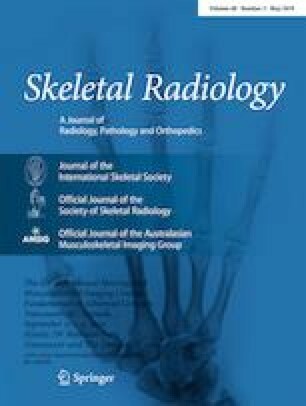 Petrover D, Bellity J, Vigan M, Nizard R, Hakime A. Ultrasound imaging of the thenar motor branch of the median nerve: a cadaveric study. Eur Radiol. 2017. https://doi.org/10.1007/s00330-017-4882-0.